After a short but strenuous loop over the lower part of Snows Mountain, I drove down to the Welch-Dickey trailhead to check out conditions. 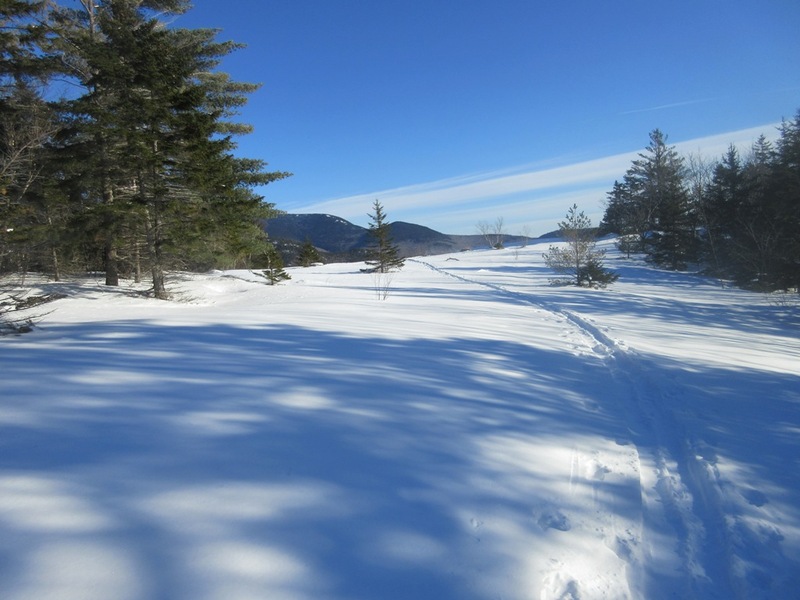 The parking lot had been freshly plowed (thank you, Forest Service! ), and, on a sunny Friday afternoon, there was no one there. 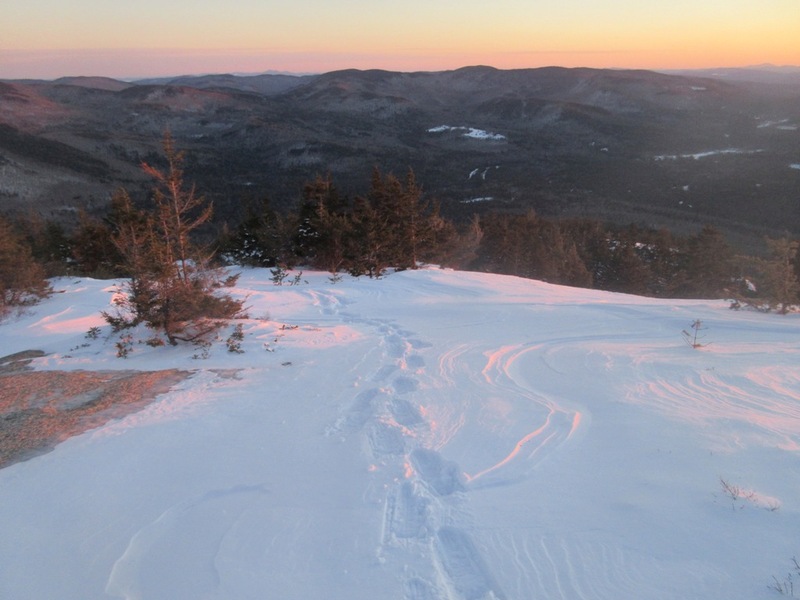 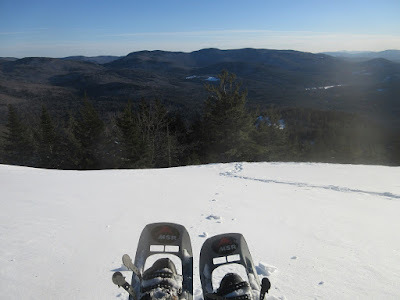 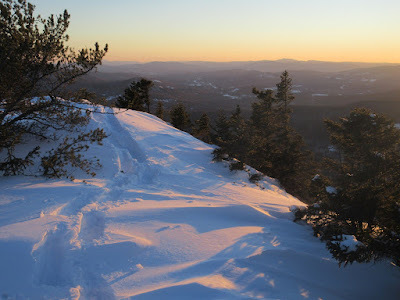 On went the snowshoes again for a late day climb. 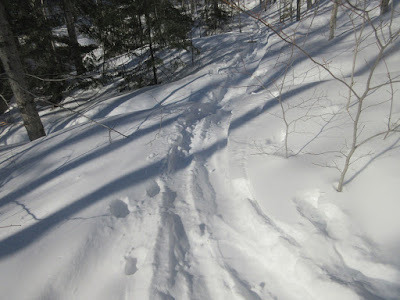 For the first 0.9 mile of the trail, I had easy breaking through 3" of powder atop a previous track. 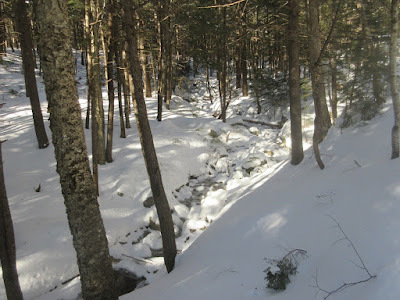 The nameless brook that drains the bowl between Welch and Dickey. Ski tracks came in where the trail begins to pull away from the brook and climb to the first view ledge. 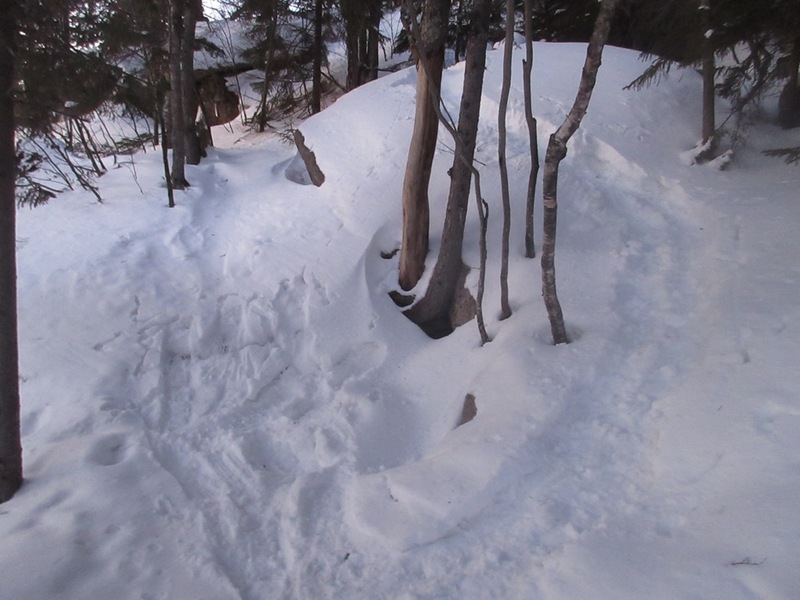 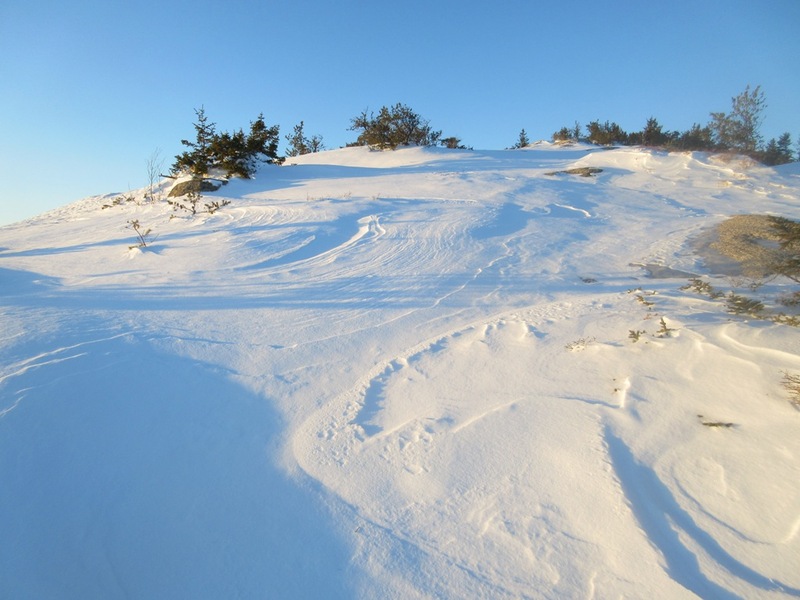 These skiers must have dropped into the hardwood bowl off the slabs on Dickey Mountain. 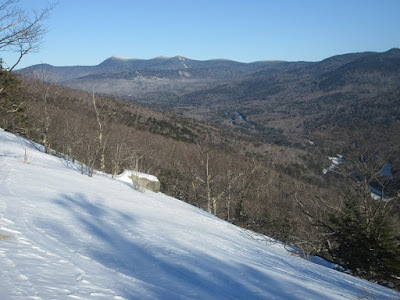 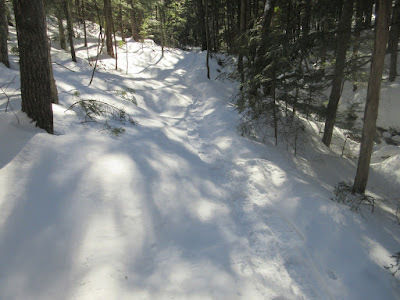 They then went up the trail to the first Welch ledge and skied down through open woods to the trailhead. 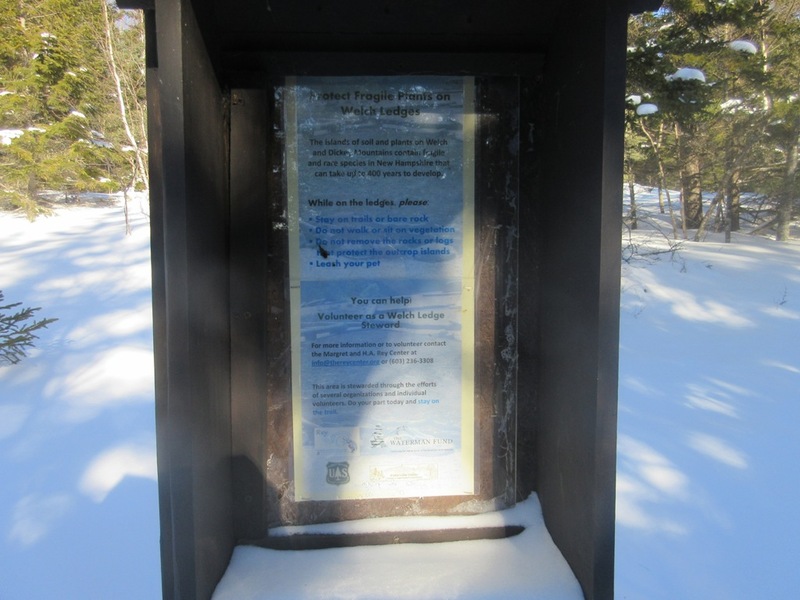 The traditional color scheme for signs made by the Waterville Valley Athletic & Improvement Association, which does a great job maintaining the Welch-Dickey Loop. The impressive Dickey Cliff looms through the trees. Important message. 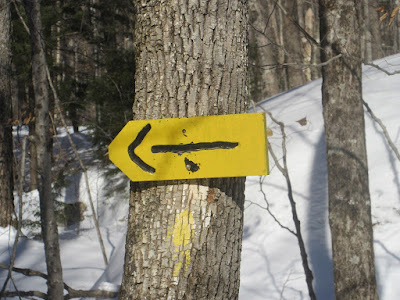 Please stay on the trail! Approaching the first view ledge on the flat southern shoulder, a great destination for a short hike -- 2.6 miles round trip with 800 ft. of elevation gain. The sprawling mass of Sandwich Dome dominates the eastern view. 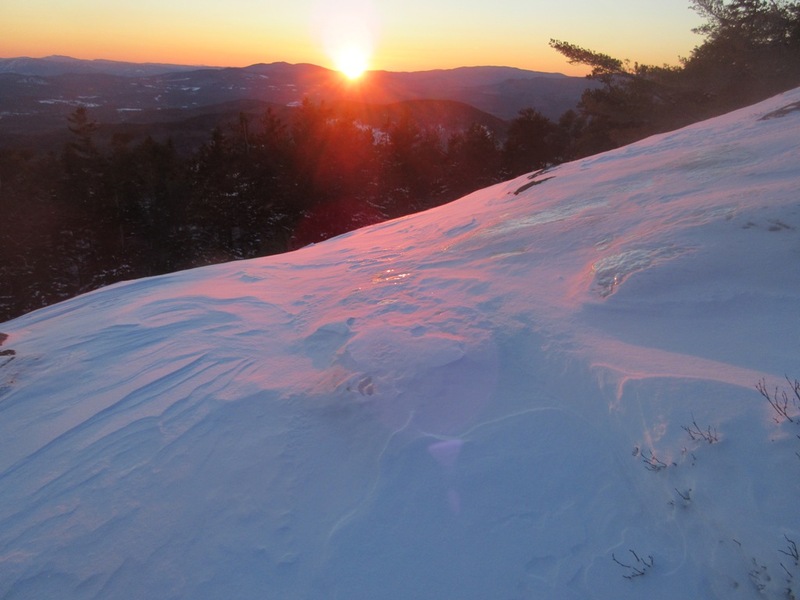 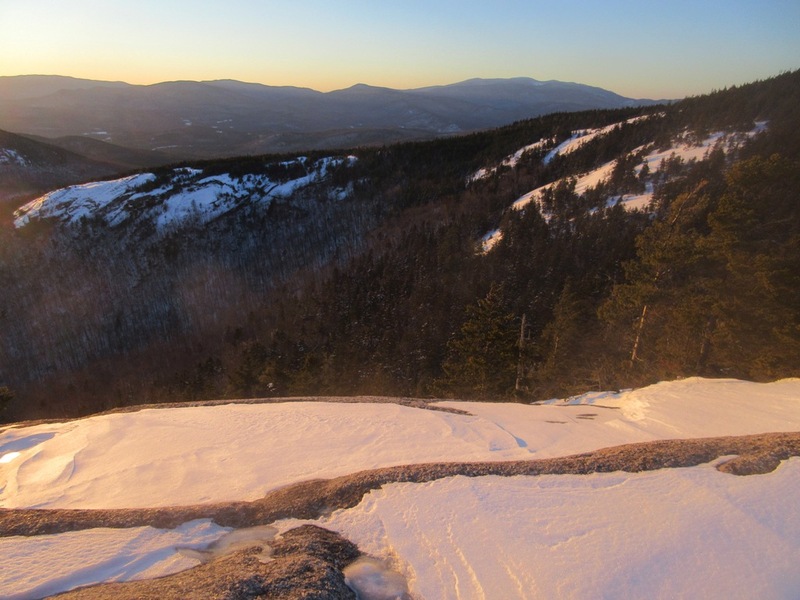 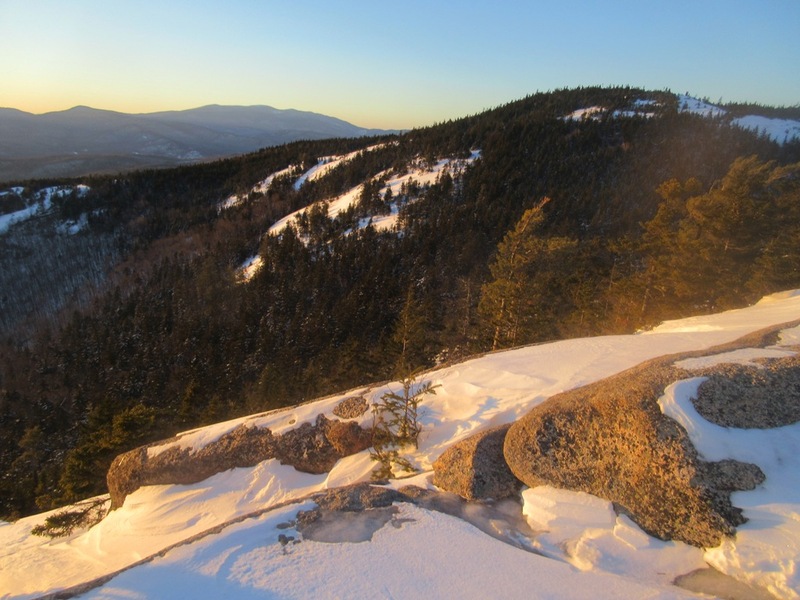 The snow-capped summit of the Dome rises above Sachem Peak. Looking back to the Dickey Cliff. 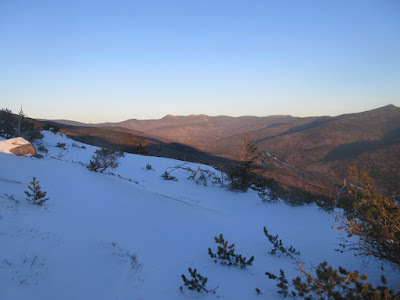 Long view up the Mad River valley to the Tripyramids and the Sleepers. 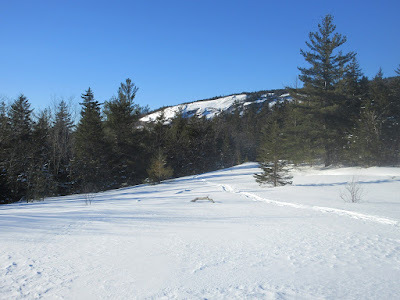 Looking up at the summit mass of Welch, with Dickey Mountain peering out on the left. Too cold and breezy to linger here. 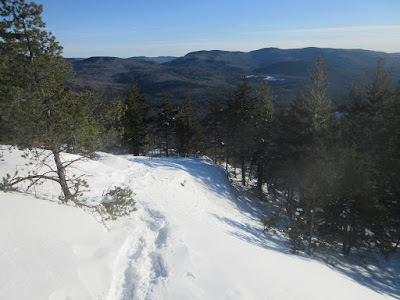 It was now after 3:00 pm, so I figured if the trail wasn't icy on the upper ledges I'd at least continue up to the big slab visible on Welch (at 2200 ft.) and call it a day. 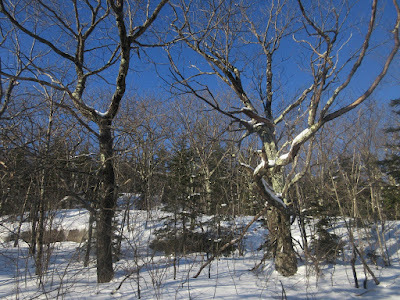 The snowshoeing was great heading up the ridge in untracked powder, passing these gnarled oaks along the way. 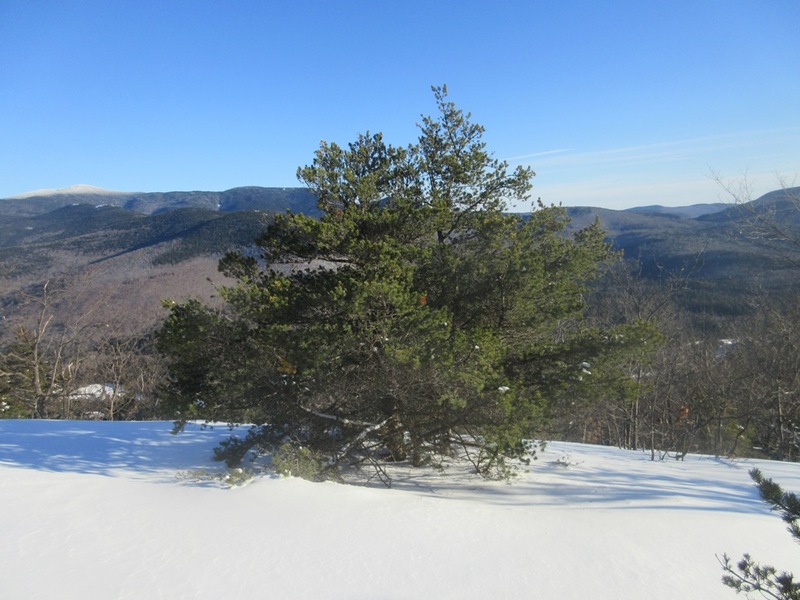 One of Welch's claims to fame is its extensive stand of Jack Pine, a northern fire-dependent tree found at only a few locations in New Hampshire. Looking back to Sandwich Notch and the Campton Range. 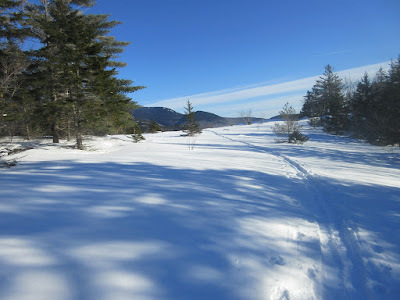 The big slab had great snow cover. 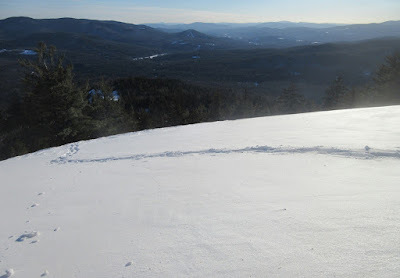 It was sunny and out of the wind here, so I sat on my pack for 20 minutes basking in the rays. Long views to the south, with Kearsarge, Cardigan and other distant peaks on the horizon. 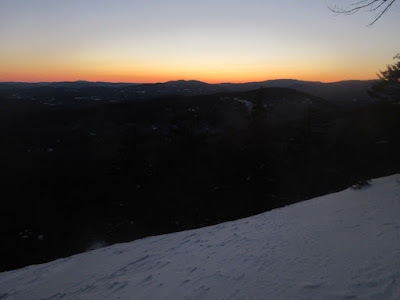 It was now 4:00, but I decided to head up to the summit for sunset. 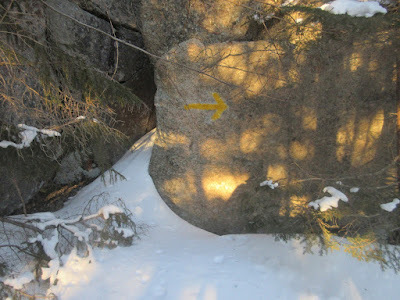 This way, through a wooded area of ledges and crevices, with a couple more ice bulges to navigate. 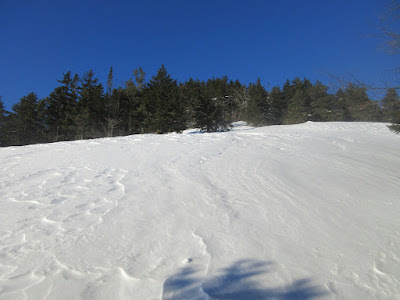 Onto the upper open ledges. 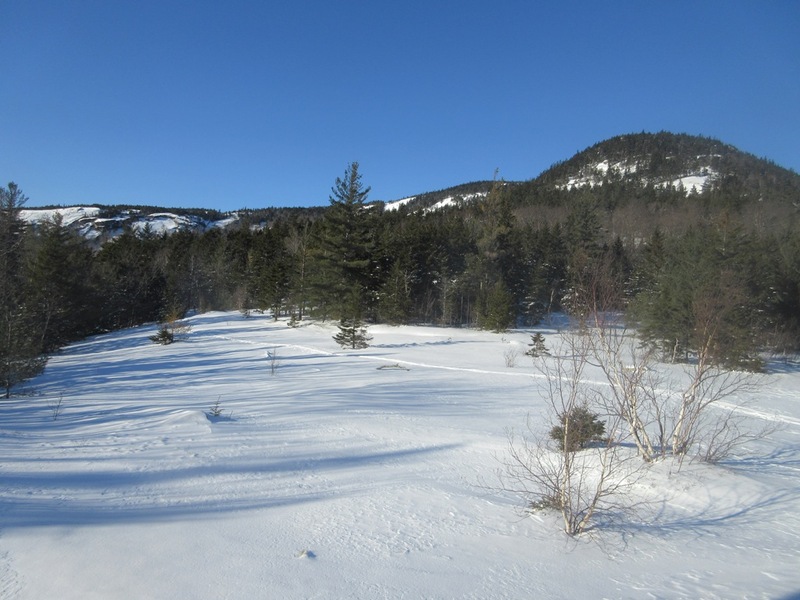 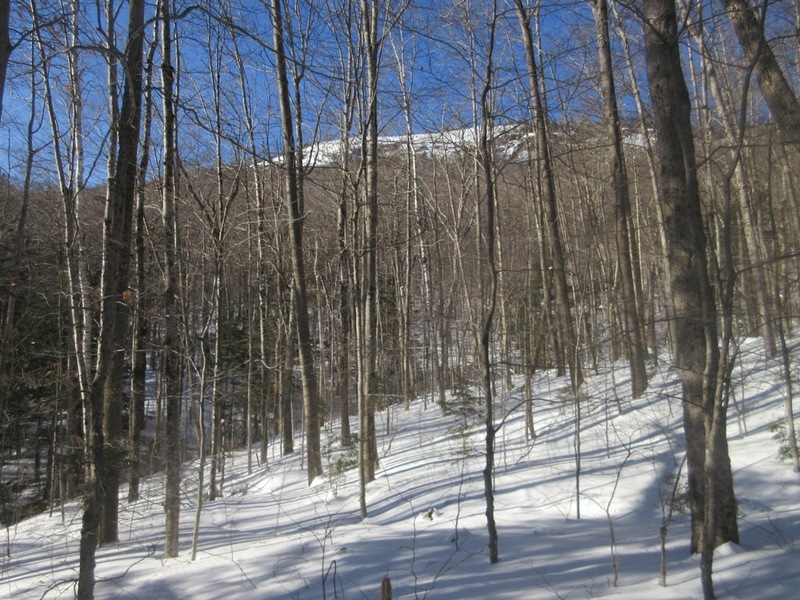 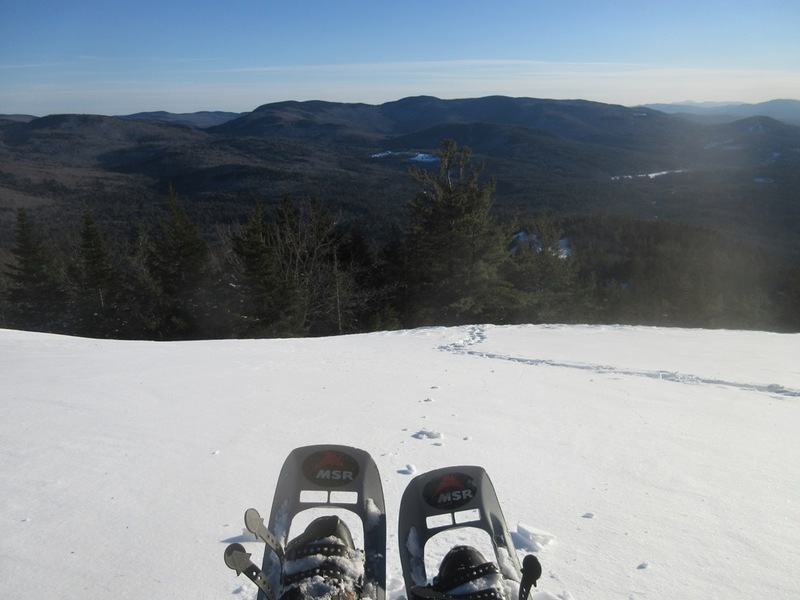 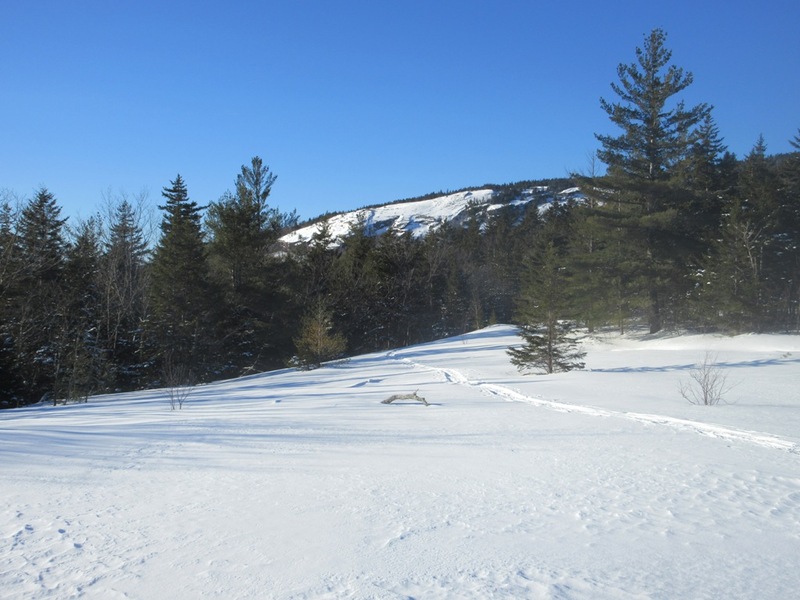 A wonderful place to snowshoe, late on a spectacular winter day. 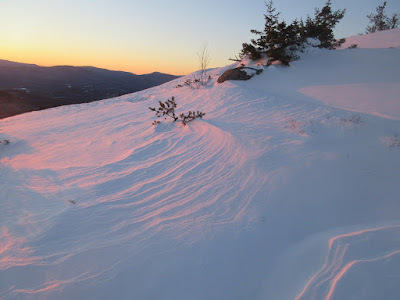 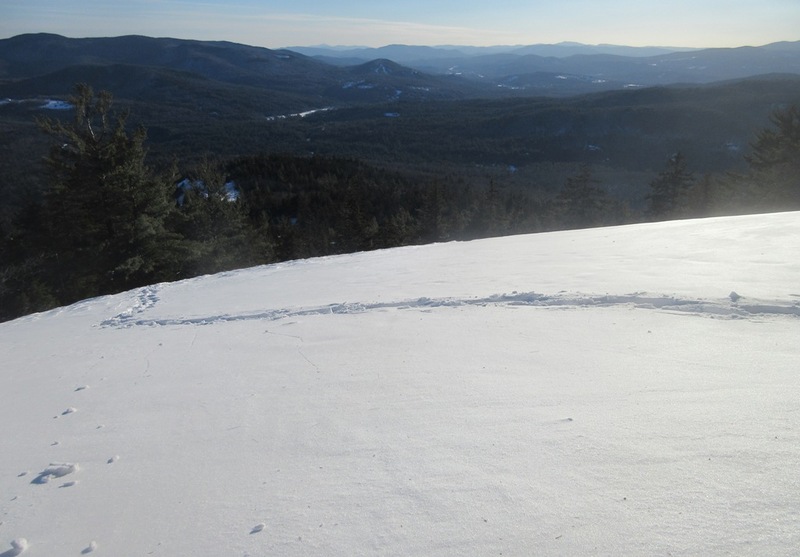 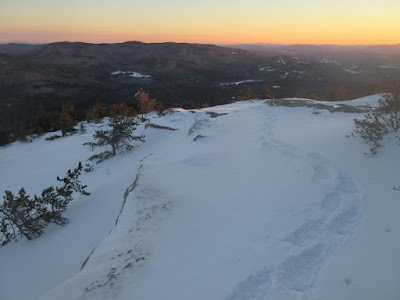 Most of the ledges had good snow cover or solid crust, with only a few icy spots hidden under the powder. Caution advised! 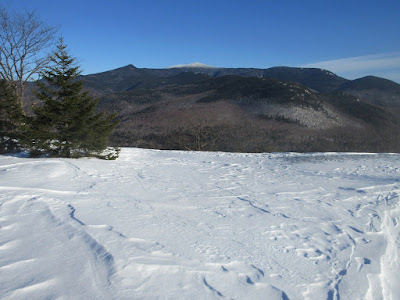 The spread of the Sandwich Range, with Mt. 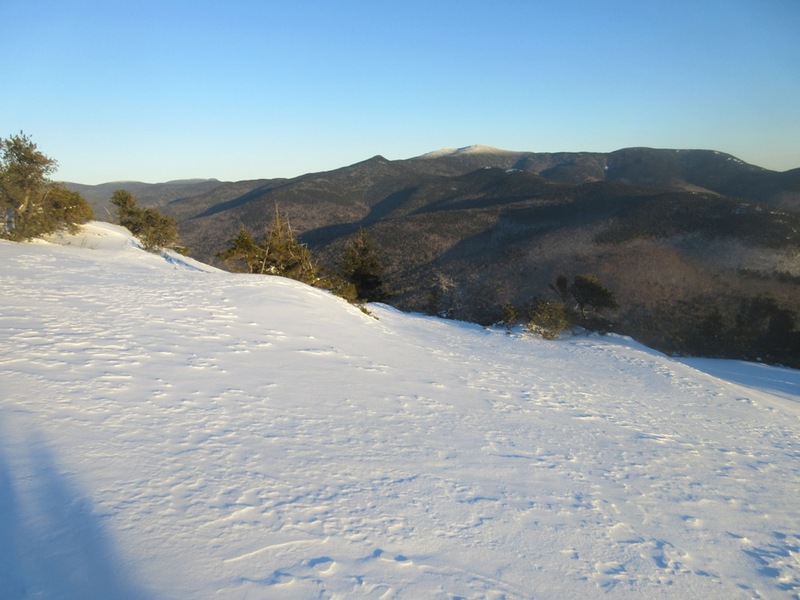 Whiteface now visible. Looking over to Dickey Mountain, with Mt. 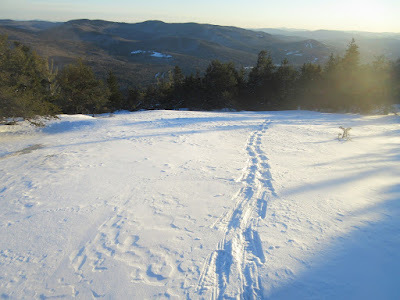 Moosilauke in the distance. 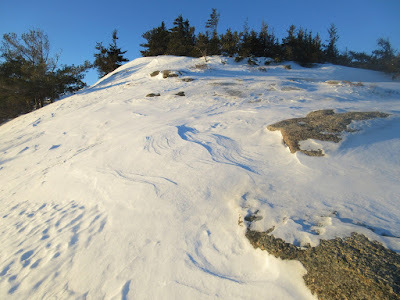 A benefit of my late arrival at the summit was an almost complete slackening of the wind. Looking down to the Dickey Cliff. 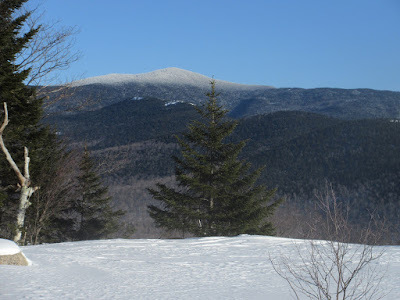 North to the Mt. Tecumseh range. 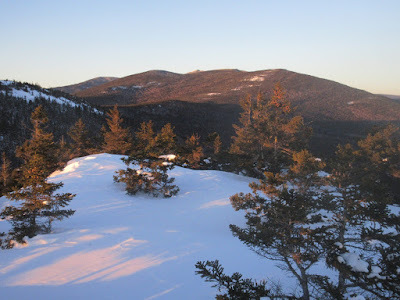 Sandwich Range behind the summit rocks. 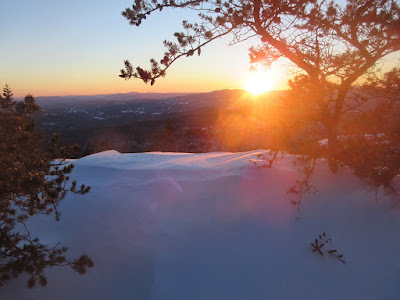 Sun going down behind a Jack Pine. 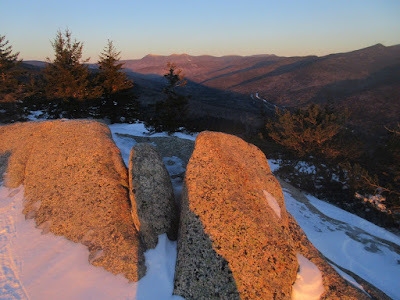 Afterglow seen from the big slab. Didn't need the headlamp until the lower 0.7 mile of the trail.